Welcome to the sixth election eve "Just Vote Dividist" post. 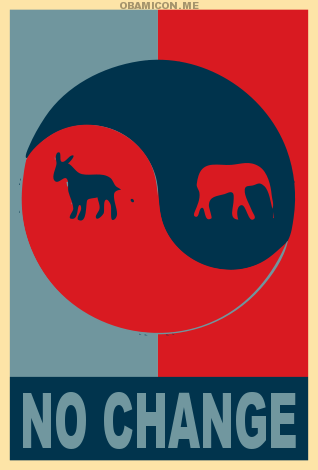 This blog was started in 2006 to advocate a divided government voting heuristic. In this post we suggest a specific divided government vote for the 2016 election. In light of the media angst surrounding our presidential choices this cycle, we'll begin by repeating one critically important and almost universally overlooked point. The President of the United States is not the government of the United States. The President of the United States is not even necessarily the leader of the government of the United States. The executive is one of three co-equal branches of government. The government of the United States is led by the Speaker of the House and Senate Majority Leader representing their respective democratic institutions, in concert with the President of the United States. The personalities, interpersonal relationships, communication skills, ideological motivation, partisan loyalties, personal ambitions, institutional obligations and dynamic interactions between those three leaders determine the domestic policy and international posture that governs the United States. The President is also the leader of a political party. When we have a unified one party government, the President may function as the leader of of the United States government if the president's party demonstrate sufficient partisan discipline. When we have a divided government, leadership of the United States government is just as likely to reside in the Congress as it is in the Executive branch. 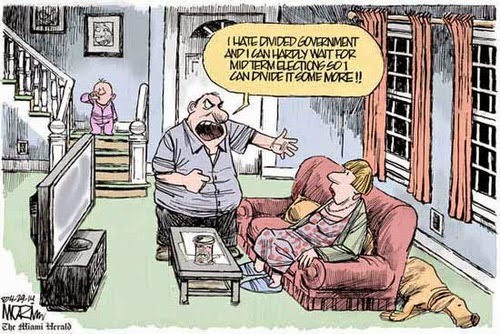 We'll come back to this point, but first some context to explain why divided government is good for us. "Federal government should be limited in scope, provide for common defense, protect and respect individual rights, spend and tax in a fiscally responsible manner, resist military adventurism, provide strong and effective oversight of elected and appointed representatives, legislate carefully and slowly, and pass only laws that are tempered in the fire of partisan debate." Dividists vote for these policy objectives. Our proposition is simple. You cannot reliably expect these policy objectives to be met with a Unified One Party Rule Government of either major political party. However, you can expect these policy objectives to be met more consistently when we have a divided government. If you agree with those policy objectives, then you should vote for divided government. If you disagree with those policy objectives, then vote for whatever partisan policies blow your skirt up. Why to vote for divided government. 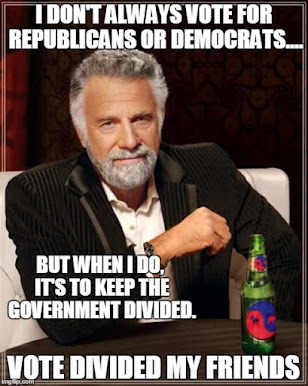 The core argument for independent voters to vote dividist. How to vote for divided government. In each federal election we recommend the simplest vote to maintain a divided government state. "There is a high probability that a Republican majority in the Senate will not last beyond the 2016 election. If we go into that election with Republicans in majority control of both legislative branches it makes the divided government vote easy to determine. There will be a greater risk of Single Party Republican Rule, so the 2016 Dividist vote will be for the Democratic candidate for president... Of course, a lot can change between now and then. But the odds are this is exactly how it will play out in 2016 if the Republicans take the Senate in 2014. And yes, under those circumstances, the Dividist will gladly support and vote for Hillary Clinton for her third term as President." Interestingly, after all the Sturm und Drang of the 2016 election cycle, we are exactly where we predicted we would be back in 2014. The House is a lock for the GOP. The Senate majority is a coin-flip. Hillary Clinton is the least worst choice for President of the United States and she is our 2016 Divided Government vote. This is not to minimize the role of the President. The President is the "Leader of the Free World" and "Commander in Chief" of the most powerful military in the history of the world. The "Unitary Executive" has extraordinary, almost monarchical latitude over United States foreign policy. However, U.S. domestic policy is forged primarily in the House of Representatives, by design. The "People's House" - the most democratic of our government branches, is where the framer's intended and expected domestic policy to be created and shaped. This is why the House is the first branch codified in the first article of the Constitution. This is why the Speaker of the House is second only to the Vice President in succession to the Presidency. The Senate - representing the States - was intended by the framers to be a moderating influence over the majoritarian domestic policies of the House and the foreign polices of the President. 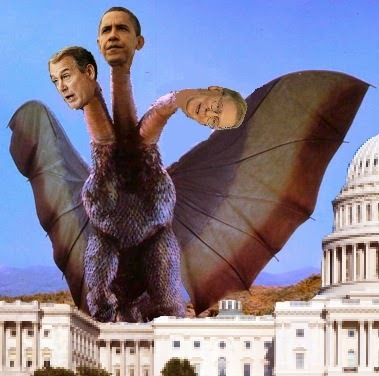 A co-equal triumvirate that is susceptible to gridlock governs the United States. This structure is unique. This structure is exactly what the framers intended. This structure is what makes our system exceptional. The point is this - Given that this power sharing triad is the essence of our elected government, perhaps we - as voters - should focus less on the singular office of the President and more on the combination of leaders that will run our government. 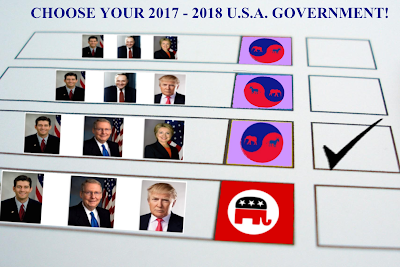 With that in mind, we are pleased to present you the four actual, realistic 2017 - 2018 United States Government choices, stack ranked by Dividist preference. We've made one simplifying assumption, recognizing the fact that there is no realistic possibility of the GOP losing the House majority this cycle. 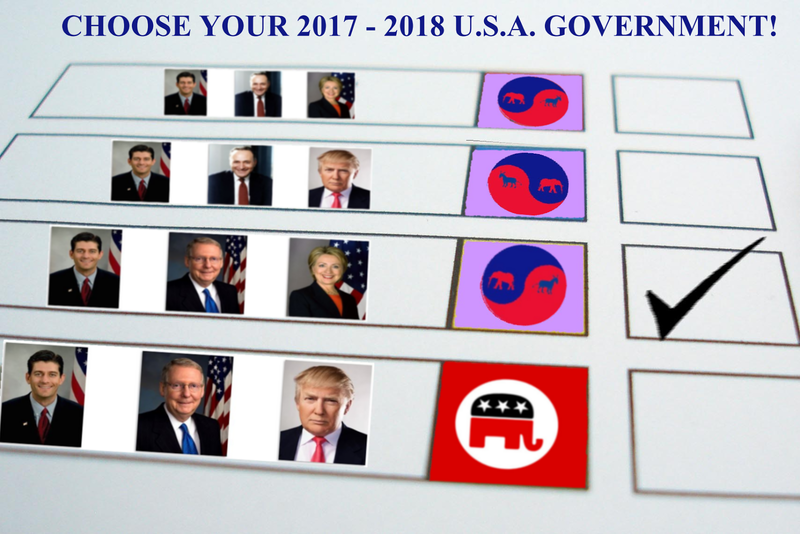 One of the following four options will be elected on Tuesday to govern the United States for the next two years. This is the Dividist's preferred outcome. The gold standard in divided governments. It worked out well in the previous Clinton administration and was pretty good at keeping Obama in check over the last few years. Some analysts even suggest this configuration is best for the economy and stock market. Your mileage may vary. Democratic President, Democratic Senate, Republican House. This is a close second choice. The biggest impact would be on Supreme Court nominations. If the Democrats take the Senate, it's conceivable that Democrats will invoke the "nuclear option", stop the Garland nomination, and give Clinton a free hand on a more liberal Supreme Court pick. Republican President, Democratic Senate, Republican House. Should Donald Trump win the election, we can only hope the Democrats take the Senate majority in order to maintain divided government and constrain his megalomaniacal and authoritarian instincts. This is a possible but unlikely scenario, as a Donald Trump win would probably indicate he has sufficient coattails for the Republicans to maintain a narrow Senate majority. This represents the worst of all possible worlds. Donald Trump would be a big spending, big government president with a lapdog Congress in a One Party Republican Rule unified government. Been there. Done that. These are your choices America. Choose wisely.